What will I do I hear you cry? I am glad you ask because I do have a solution to this issue. This solution I speak of is to hire Mr Yoast: Mr @Yoast is probably one the most well known and knowledgeable SEO persons around. If you visit his website you will chance upon a service called Website Review where Mr Yoast and Co will dig deep into the inner depths of ones website and provide a detailed report on what aspects of SEO need fixing/changing/tweaking etc. Time has come to enlist the valuable services of Mr Yoast for the imjustcreative website. I shall write about the process which will hopefully provide some useful feedback as well as all important peace-of-mind. Our website review sorts through all the bugs in your current system. It opens your eyes to new strategies you never knew existed – ones that make your rankings and your online sales soar. We’ll take a hard look at your site’s performance, your site design & structure, your basic SEO practices, your tagging and linking strategies, and a whole lot more. If there’s a problem, we’ll find it. And then we’ll explain exactly how to fix it. Recommendations on your site’s structure and design. Suggestions to improve your site’s HTML code. Smart optimization strategies to increase your website rankings and SEO traffic. Techniques to convert those visitors into buyers or subscribers. 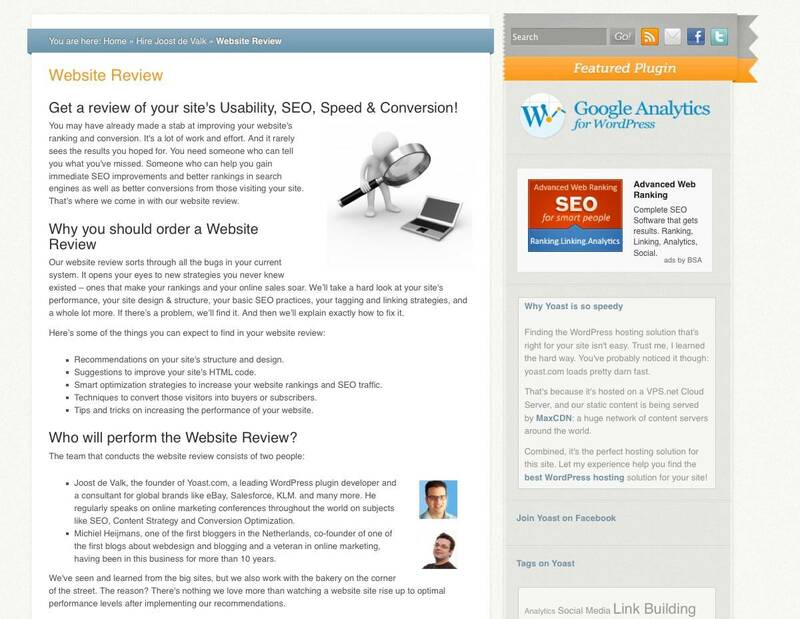 Tips and tricks on increasing the performance of your website.